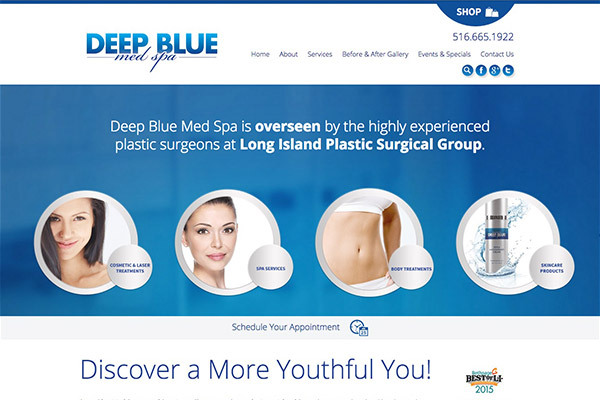 Deep Blue Med Spa, overseen by the plastic surgeons at Long Island Plastic Surgical Group, reveals its responsive website and a new location designed to provide an optimal experience online and in person. Long Island, NY — Long Island Plastic Surgical Group, PC (“LIPSG”) announces the opening of its new, luxurious Deep Blue Med Spa and the re-opening of its freshly renovated headquarters at 999 Franklin Avenue in Garden City. The practice has multiple locations on Long Island and Manhattan, making it the largest plastic surgery practice of its kind in the country. To further enhance patient care and convenience, the doctors of LIPSG partnered with Rosemont Media, a medical Internet marketing firm, to develop a state-of-the-art responsive website. The list of updated features includes an easily navigable interface, informative content, and improved accessibility for users on both mobile and traditional Internet-compatible devices. LIPSG says the new site reflects the office’s mission to provide compassionate, comprehensive medical care utilizing the most advanced techniques and technology available. The doctors of LIPSG explain that patients considering facial and body rejuvenation treatments are increasingly researching procedures from their mobile devices. 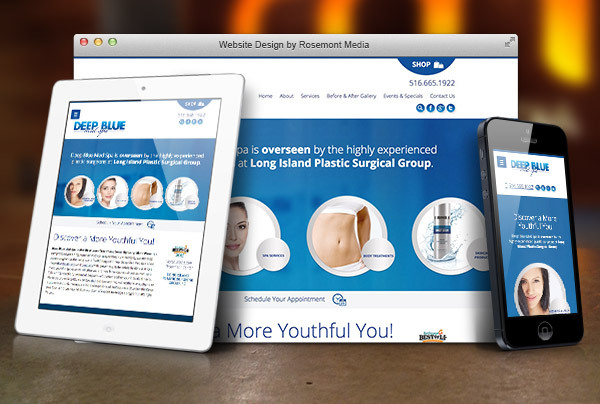 As a result, the Deep Blue Med Spa site is equipped with a responsive layout that automatically adjusts to fit the screen of any Internet device, including smartphones, tablets, laptops, and desktop computers. To help position the website favorably in its marketplace, leading medical SEO strategies have been utilized, which allow individuals to more easily find the medical content they are seeking. The LIPSG team says that achieving an exceptional patient experience begins before someone arrives at the office and continues throughout treatment. For this reason, the physicians performed a comprehensive upgrade to both the website and the brick-and-mortar facilities, including remodeling the Garden City location. “The re-branding and expansion of the med spa is an exciting extension of the experience offered by our practice,” explained Deep Blue Med Spa Medical Director Dr. Laurence Glickman. “Our surgeons have over 200 years combined experience and have built a reputation as pioneers within the industry, accomplished in both cosmetic and reconstructive surgery, as well as non-surgical procedures. The renovation of Deep Blue Med Spa is a natural progression in the growth of the practice,” he continued. Deep Blue Med Spa is designed to provide patients with world-class premium spa services focused on comprehensive treatment options in an open, airy, and relaxing environment. The LIPSG physicians explain that the medical spa offers the most innovative treatments and products available. Programs are customized for every patient’s individual needs, which includes offering routine skin assessments and full skin rejuvenation makeovers. Specially trained medical aestheticians backed by 19 surgeons from the practice offer state-of-the-art cosmetic enhancement options at Deep Blue Med Spa. Procedures include CoolSculpting® and Ultherapy®, as well as a variety of skincare treatments, chemical peels, spider vein removal therapy, laser skin resurfacing, and laser hair reduction. The spa also offers an exclusive skincare line that has been formulated to complement spa services, restore and maintain healthy skin, and enhance radiance and beauty. Deep Blue Med Spa, formerly known as the Aesthetic Center, offers an extensive range of non-surgical skin care and rejuvenation options. Overseen by the highly experienced team of plastic surgeons at Long Island Plastic Surgical Group, Deep Blue Med Spa utilizes state-of-the-art treatments and technology designed to achieve optimal results within a luxurious setting. The medical team is comprised of physician assistants and medical aestheticians dedicated to the highest levels of safety and comfort attainable. Deep Blue Med Spa has multiple locations in Long Island, including Garden City, Manhasset, and Babylon and is also located on Park Avenue in Manhattan. Established in 1948, Long Island Plastic Surgical Group (LIPSG) was one of the first plastic surgery groups in the country dedicated to providing the latest techniques in cosmetic surgical procedures. LIPSG was founded by two plastic surgeons who, having just returned from serving in World War II, opened the practice in New York. Over the years, LIPSG has developed its own residency program, expanded to multiple locations on Long Island and Manhattan, and established successful relationships with major hospitals in the area, making it one of the leading plastic surgical practices in the country. The practice has received numerous awards, including “Best Plastic Surgery Group” and “Best Laser Treatment Center” in Long Island Press’s Best of Long Island Awards program. The group operates out of nine Centers of Excellence: Skin Care and Age Management; Non-invasive and Surgical Facial Rejuvenation; Pediatric Plastic and Craniofacial Surgery; Facial Reanimation and Peripheral Nerve Repair; Microsurgery and Hand Reconstruction; Breast and Body Cosmetic Surgery; Burns and Complex Wound Management; Breast Reconstruction Surgery; and Post-Weight Loss Cosmetic and Reconstructive Surgery. For more information about Deep Blue Med Spa, please visit deepbluemedspa.com and lipsg.com.